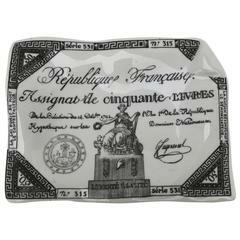 A fine and beautiful Hermès Limoges vintage oblong porcelain ashtray with golf ball motif in Fornasetti style, partly gilt, in colors green, white, grey and red. 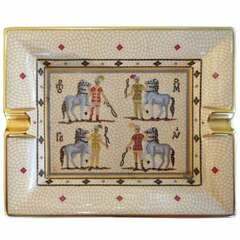 Marked Hermes Paris and Made in France to the side and suede covered to the base for protection. 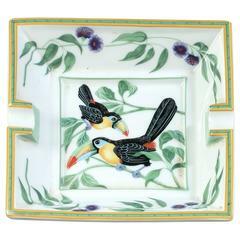 This ashtray which stays in very good original vintage condition with minor wear consistent with age and use is 18.5 cm / 7.28 inches wide, 15.5 cm / 6.10 inches deep and 3.5 cm / 1.38 inches tall. 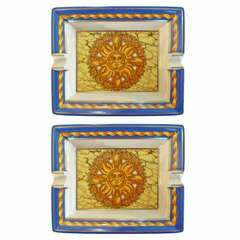 Vintage Fornasetti porcelain dish as a ashtray or pin tray Complementary delivery to New York City. 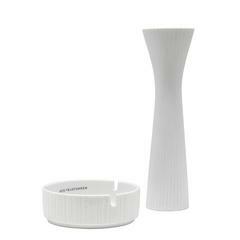 Wonderfully tailored and textured porcelain vase by Rosenthal Studio Line with matching ashtray for AEG-Telefunken. Celadon green and white glazed ceramic round golf balls ashtray from 1980’s Holland with realistic details on the golf balls Dimensions: 8.5" W × 8.5" D × 2.5" H.
Golf ashtray in an excellent condition. France, 1960s.